Thomas Kennedy, (1776-1832), author of the "Jew Bill", had never met a Jew in his life; Yet, he began a bitter eight year struggle that culminated in 1826 with the Maryland constitutional changes that freed Jewish citizens of the "Free State" from political discrimination. Kennedy, elected from Washington County, was a Jeffersonian Republican. He took to heart the ideas of equality, freedom and human rights as the concepts were being evolved and applied in the young American Republic. Discrimination and political dissenfranchisement in the Maryland Constitution were vestigal wrongs that had carried over from Maryland's early colonial anti-Catholic history. Kennedy set his goal, from the beginning of his public life, to correct the injustice against all Marylanders. A joint effort of JASHP and the Maryland Historical Trust, the interpretive marker is located along Rt. 65 in Hagerstown, next to Rose Hill Cemetery. The Maryland Consititution of 1818 maintained religious test requirements the effectively prohibited Jews from being elected to State office. Kennedy, a Scottish Presbyterian immigrant, was elected in 1817 from Washington County. Kennedy believed religious discrimination was wrong. He began a bitter eight year struggle culminating in 1826 with the consitutional changes that freed Jewish citizens of Maryland from political discrimination. 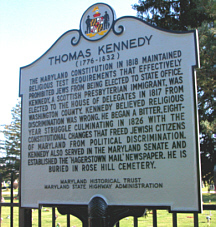 Kennedy also served in Maryland Senate and established the "Hagerstown Mail" newspaper. He is buried in Rose Hill Cemetery.